Size: 753 sq.ft. - 1904 sq.ft. Nshama "Warda" is part of 450 acres Town Square community. Town Square is thoughtfully structured for every resident lifestyle.It is a huge city covers Multiple Towers, Villas, Townhouse, Schools, Restaurants, Shopping Malls and many others. Warda Tower offers units of various sizes where residents will also have access to a coffee shop, a cineplex, and a convenience store. The Town Square Park is reportedly the size of 11 football pitches.Warda apartments have been expertly designed by keeping in mind thetaste and preferences of its buyers.The Warda possession is expected by September 2018. Warda Town Square by Nshama Developer is a mid-rise apartment building located in the Main Square of the community. 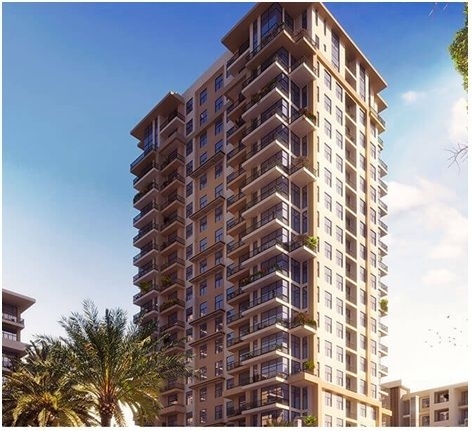 This project is considered to be at the most prime location within the larger Town Square development.Each apartment has been built generously with a unique style and well-proportioned interiors.The township of Town Square is specifically designed with commercial and residential landmarks.Warda Tower holds super spacious unit configurations of 1-Bedroom, 2-Bedroom & 3 Bedroom with sizestarting from 753 Square feet to 1904 Square feet. NShama has been offering sustainable world-class sophisticated communities. It is a leading real estate group and heart and soul of the Dubai residential community. Nshama Properties vision is to bring a new lifestyle options to Dubai that transforms the lives of people by offering mega communities for families but will also provide a full-fledged, thriving range of lifestyle developments like restaurants, hotels, cafes, play areas, educational institutes, community parks, health centers, malls, retail stores and more. Nshama Builders have great presence in Dubai Infrastructure with some of the most beautiful buildings in all over Dubai & UAE. Nshama Properties is the one of largest real estate company and still growing with lots of projects under construction. Warda Project is located within of Al Qudra Road and Emirates Road. It is located right on Town Square Park in the heart of Town Square Dubai that the residents step outside and enjoy the fresh breeze.At the nearby can also enjoy one of the surrounding 350 shops.Vida Hotel for deluxe dining and Real Cinema for latest blockbuster films is quite popular in Town Square area.It is a prime location for property with excellent potential for further growth due to its proximity. * Arabian Ranches – 8 mins. * Burj Al Arab is 16 mins away from the location of Wards. * Dubai Expo 2020(a universal exposition) - 20 mins. * DWC Airport at 21 mins away. * Downtown Dubai – 22 mins. * Dubai Mall – 22 mins. Nshama Warda Tower is located directly on Town Square within the space between Al Qudra Road and Emirates Road, Dubai, United Arab Emirates. Nshama revealed this great infrastructure with lifestyle facilities & amenities like Retail stores, Restaurants, Healthcare Clinics, Hospitals, Skate parks, Jogging track, Biking trails, Town Square Park, Community gardens, Outdoor and indoor Reel Cinemas, Central Air conditioning, Fire Fighting and alarm system, Parking, Basketball courts, Football field, Outdoor gyms, Tennis courts, Swimming pool.